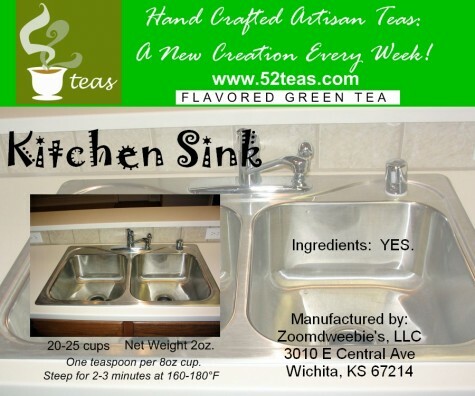 Kitchen Sink Green Tea from 52Teas & A NEW CONTEST! There are fruit peels, dried fruit, freeze dried fruit, some ginger and some lemongrass mixed in it. It is spectacularly ridiculous. I’m not sure if you will taste each of the flavors in every cup or if every cup will be a little different, but it will definitely be interesting. I brewed up a cup of this so that I can start writing about it… however, it disappeared from my cup before I could start writing! Yep… it’s that good. So, before I could start composing this review, I had to go and brew myself a second cup. Wow! This is one seriously fruit-flavored tea. Because it’s got so many different flavors in there, it’s difficult to discern one from another – and I’m having a hard time trying to describe for you what I’m tasting right now. What I can say is that it’s absolutely delicious! On Steepster, I think I described the flavor as a huge fruit salad composed of the largest assortment of fruit ever. Or something like that. But, I think a more accurate description would be a fruit smoothie blended with the largest assortment of fruit ever… and replacing the yogurt with a smooth, sweet green tea base! And yes, I can taste the tea. It is made with a Chinese Sencha, and I can taste it’s rich, buttery flavor with just a hint of vegetation. Not grassy, and not even strongly vegetative… just a mere insinuation of lush green-ness to go with the sweet flavors of fruit. This tea is fantastic hot, and equally as good iced too. I do recommend adding a little sweetener (I chose agave nectar) to it because it really brings the fruit flavors to life. A truly delicious and unusual tea delight! CONGRATULATIONS TO Melissa Wrzesniewsky & michelequake! It’s about time for another SororiTEA Sisters contest, don’t you think? This week, you can win a 2 oz. pouch of KITCHEN SINK from 52Teas! And, if you’ve read the review above, you know I’m speaking from experience when I say that this tea is absolutely, ridiculously delicious! 1. Post a comment on this review. Be sure to include a way for us to contact you if you win. 2. That’s it. Just… comment on this review, and you’re entered into the contest. Simple, right? a) Click on our Facebook widget on the right of the blog and become a fan! If you’re already a fan, that’s great! Just let us know! b) Post a link to this contest on your Facebook page to share with your friends! c) Blog about this contest! Be sure to include a link to this contest and let us know so we can check out your blog! OK… so that is FOUR additional ways that you can earn entries into this contest! We will be drawing the winner by random draw on Sunday, August 8th! So ENTER NOW and please TELL YOUR FRIENDS! I’m a bit intrigued about this one….sounds like my husband would love it! I’ve gotta enter a contest that starts on my b-day! Hopefully that’ll bring me luck, this tea looks good! Sounds absolutely devine! I will be putting in an order right away. Can’t wait to smell all the wonderful fruits in a warm refreshing tea! Thanks for reviewing this product! I would be interested in trying this one. Can’t wait till I get mine !! I am looking forward to it to have a nice iced tea!! Oooh, this sounds too good to pass up. This tea is definitely on my to try list. Love the fruit salad flavors. This crazy tea actually sounds really really good! Would love to try it! Well, I don’t like cranberry (or cran-raspberry by default), mango, or guava but I still want to try it. If I don’t like it, I’m sure someone I know will. 1) Going to facebook fan right after I post this. 2) Link on facebook: done. 3) I don’t think my blog is the sort you want this advertised on. It’s not search accessible or anything. Contact through twitter or facebook (Ozymandias Creed) please. Count me in. I liked you on Facebook and if you need my mail, it’s on Gmail and the user part is my name DOT my surname. Oh, this is too good to pass up! I was skeptical of this tea, but the reviews look wonderful! My order is on it’s way. Wish it would hurry. Would love to be sipping some now while relaxing after a very busy day. Postman, ride faster! It sounds weird, but everyone says it takes good. Would be interesing to try it. Thank you for the contest. What a iteresting tea this would be to try I like fruity greens. Oh noes, it looks like I just missed this one. (A bit behind on the Steepster forums. =) ) This is a tea I am interested in trying. Luckily, Frank seems to have quite a bit of it so as soon as I finish up some tea, it may be one of several yummy 52 Teas options to order. As always, love that your blog has free tea contests! And great reviews!